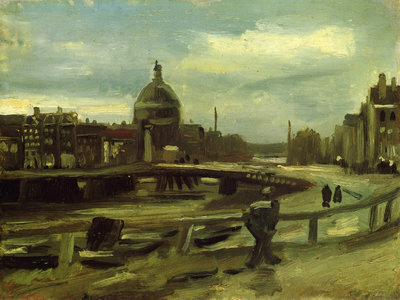 View of Amsterdam from Central Station is a painting that Van Gogh created during his short visit to Amsterdam in October 1885. This exhibits his talent of capturing things exactly as he saw them. In October 1885, Van Gogh paid a visit to Amsterdam where he spent about three days, exploring the works of Rembrandt, Frans Hals and others at the museum there. In his letter to his brother Theo, he wrote that he painted these two small panels in a great hurry. One was painted while he was waiting in the station waiting room for the train (He says he had reached the station too early). The other was painted while he was on the way to the museum. 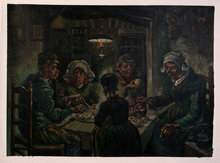 He instructed his brother to consider these paintings as “Dutch Tiles,” which involved but a few strokes. 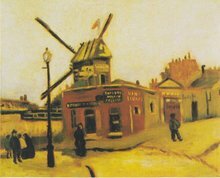 Van Gogh’s uncle had a store in Amsterdam which he and his friend visited while in Amsterdam. 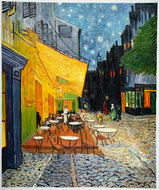 However, Van Gogh did not enter the store. This must have been because of his strained relationship with the family, due to his experiences at The Hague during the period 1881 to 1883. 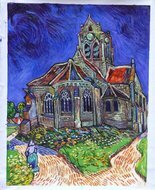 Cornelis Marinus, the art dealer uncle of Van Gogh had commissioned twenty ink drawings of the city of The Hague, which Van Gogh completed by May end. However, his uncle did not accept them. 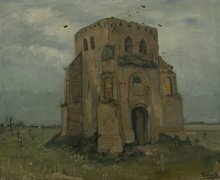 Further, Van Gogh had a tiff with Anton Mauve, his cousin-in-law who had trained and guided him to develop his artistic skills and had even funded a studio for him. It was Van Gogh’s domestic relationship with Sien Hoornik, a pregnant prostitute that didn’t go too well with Mauve and his family.